Dr. Ayres welcomes you to Ayres Chiropractic & Sports Injury Center! 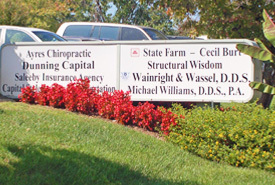 Situated in the heart of North Raleigh, our office is located in the Wainright Building on the corner of Falls of the Neuse and Newton roads, across from Circle K. The practice is easily accessible from downtown Raleigh via Wake Forest Road and Falls of the Neuse Road. Patients coming from Cary and Durham can reach us via 540. Parking is available in front as well as behind the office. Should you have questions about directions please give our office a call and we will happily assist you.